always lament about the waste of electricity when you make a cup of espresso? well, with The Hand Powered Espresso Maker you can now enjoy a cuppa while cutting that lamenting. 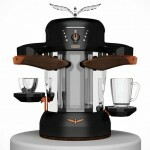 as the name suggests, it lets you make your favorite brew without using a single watt of those precious electricity. 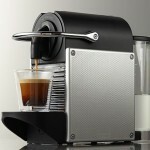 constructed from durable cast aluminum for main body and hard plastic for the water reservoir, the machine’s ground coffee holder or portafilter as it is called, can hold up to two shots of ground coffee and together with the removable dual spout, it can dispense two brews on one go, so you and your bud can both enjoy a cup of the pipping hot brew together. all you need to do is to pour hot water into the top unit, load up your favorite ground coffee and push down the levers down to create up to 10-bar of pressure for extracting the blend. it even comes with a hand powered frother for you to create foamy milk for your lattes or cappuccinos. i am totally sold by the idea. not that i am a green-junkie or anything like that but the prospect of depriving my electricity company the extra cent or two from my hard earned money is certainly welcome. the Hand Powered Espresso Maker is available now for $149.95 from Hammacher Schlemmer.